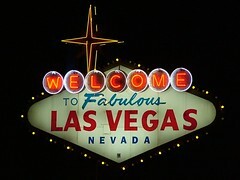 Back from a week in Las Vegas and the 2009 Digital Signage Expo, I'm struggling to find a way to summarize what I saw, heard and experienced that won't just be a rehash of what so many others have done across the web already. Sure, there were lots of great conferences and presentations. And there were lots of booths showcasing new and interesting products. But I didn't get to see most of those, and I didn't get a chance to meet up with a lot of the people that I had on my list. Thus, any "comprehensive" overview from me would be woefully incomplete. Instead, I'd like to go through some of the things that struck a chord with me -- especially the developments that give some perspective on where our industry might be headed. I had the opportunity to speak at sessions for both the "Content Day" track and the "Mobile and Gestural Signage" track on Tuesday, before the expo hall opened. The good news is that the Content Day room was mobbed -- it was standing room only the whole day through -- which means that there are at least 120, maybe 130 people out there who understand how important this stuff really is. That day's festivities began with a creative brief smack-down, with four different creative houses competing for a hypothetical contract with Samsung. There were several other good presentations, including a very interesting and illustrative panel session with a bunch of content lawyers at the end of the day. What I learned from the lawyers: if you're doing anything that effectively allows you to make money off of somebody else's content, you need permission. What I learned from the audience members: many companies are too cheap/small/busy to get permission, so they're going to shoot first and ask permission later. My favorite quote of the day came from Show + Tell's Phil Lenger, who gave a fantastic presentation on developing a creative strategy (echoed on their pretty killer new website too). His fundamental insight: your digital signage network simply can't be compelling all the time, so don't try to make it. Strive to be really, truly compelling sometimes, so that your audience will come to appreciate your quality content, but not get tired out. It's one of those counter-intuitive thoughts that makes so much sense after you've worked on a network -- or ten or a hundred. He also has some pretty charts and graphs that you might want to download from here (PDF format). As I mentioned, I didn't really get a chance to spend a lot of time on the show floor aside from walking to or from meetings. There was a lot of square footage, and a LOT of exhibitors. Conversely, floor traffic looked a bit down from last year (though it might have been an illusion because there was so much empty space). But the folks I talked to were pretty happy with the traffic levels, and generally thought that turnout was good. It certainly could have been much worse given this economy. Every cab driver I came across made an effort to tell me that business was down 30% from last year. I think they were mostly fishing for bigger tips, but I'm sure the story was rooted in truth somewhere. Aside from lots of new ways to interact with screens, it also seemed like everyone and their brother were also flogging 3D screens of some sort or another. I've been watching those things evolve for years, and this is the first time I've come across one and thought "you know, that might actually work." The manufacturers seem to be figuring out how to improve brightness and viewing angle. I understand they're getting cheaper, too. Along the same lines, the small form-factor, low-power media player seemed to come into its own at this year's expo. There were easily a dozen companies on the floor flogging tiny, fanless boxes for digital signage. Too bad most of them still cost upwards of $1,000. But the trend towards embedded devices and reduced power consumption seemed to be pretty strong. In all, I was actually kind of satisfied to find myself bored after just a few minutes of perusing booths at the DSE. We're a maturing industry now, and while there are still hundreds of vendors out there essentially trying to solve the same problem over and over, at least now the solutions are starting to look more like one another. Were there new, cool technologies that might be able to make a meaningful contribution to the industry? Absolutely. But the fact that most companies on the floor were offering "better mousetraps" instead of "new paradigms in mousetrap technology" is an indicator that maybe the flood of hype will begin to subside and we can get on to some real business. I was really surprised by the number of people who just walked up to me and said something like "Hey, you're Bill Gerba! I read your stuff all the time!". I'm continually both surprised and flattered by the amount of attention that this blog gets, and I very much appreciate the feedback -- both good and bad -- that you provide. DailyDOOH's Adrian Cotterill doesn't care much for fish. He will, however, down deep-fried soft shell crabs with wanton abandon. The folks at BroadSign had the good sense to keep Dave Haynes locked up in a small plexiglass box a'la David Blaine for most of the show. Surely they were worried that his célébrité was such that out in the open, he would be overwhelmed by hordes of die-hard fans pleading for his autograph. Neither @KioskGuy nor @DigitalSignGuy look like their Twitter icons. @raffivartian and @manolo_almagro do (the latter only recently), as do I (though I'm a bit less blue in real life). By the way, you can follow me on Twitter if you like. Speaking of Twitter, one company on the show floor actually issued a two-sentence press release indicating that they were joining the "Twitter revolution." Seriously. Lame. Lyle Bunn simply must be two or three different people. No matter where I went in the convention center, every time I turned around he was there, deep in conversation with someone or other. I walk pretty fast, so there's just no other explanation aside from there being at least two Lyle's. Scary -- I know -- but it must be true. Consumed too quickly or with too much enthusiasm, DS-IQ's specialty "Optimizer" cocktail will leave you in a decidedly less-than-optimal state, I'm told. Despite what many predicted, Scala's Jeff Porter + CoolSign's Lou Giacalone != spontaneous combustion. We had them both in a room for quite some time and there was hardly even a spark. Bummer. Oh well, maybe next time. So there you have it. Another year gone, and another Digital Signage Expo over. (Well, technically they have another DSE show coming up in September, but I'm referring to the flagship event.) For me, the show was a good opportunity to see what the industry has to offer and meet up with people I normally only get to talk to on the phone or over the 'net. If you made it out there, I'd love to hear your perspective on how the show worked for you, and whether you think it will help you to meet some business objective in the future. What was your favorite conference session, or your favorite booth on the show floor? Leave a comment to let us (and them) know! I won't/can't comment on the quality of the panel that I moderated, "What's next at retail?" . Rather, I can cite the size of the audience. Our panel had the dreaded time slot: 3PM, day two. I anticipated we would be talking to ourselves. But no. We had over 50 people in the audience. Shocking. (Bill, maybe you remember that dreadful conference in Ft. Lauderdale when there weren't 50 people in the room on day one, session one. And that's counting the bus boys.) Our panel's big draw was Mike Hiatt, formerly of Walmart. Mike addressed, as he put it, "the elephant in the room", his recent departure, with wit and a sense of humor. Thanks also to fellow panelists Gale, Brandon and Vincent. All things considered, 50 die hards hanging in/staying awake/asking questions during the late session on day two is encouraging to say the least. Good to finally meet you at DSE. You did a great job moderating the Mobile Interactivity Panel. Chris: I also saw a couple of demos with "instant" mobile response via alphanumeric. Last year it was all about MegaPhone. This year it seems like they have some competition. Adrian: Congrats. You, my friend, have just given yourself a new nickname. Pat: Yeah, I remember that conference. I'm just glad it was local :) I got some feedback on your session, and as you noted it was mostly about Mike Hiatt's departure. While I know you can fill a room, I think a lot of people simply couldn't believe that after how much Walmart has hyped their Smart Network he was getting laid off. Jake: Well, **we** are the best you can buy on the market, so you obviously got duped. Stephen: Good meeting you face-to-face too, and thanks for the compliment. When you say "In all, I was actually kind of satisfied to find myself bored after just a few minutes of perusing booths at the DSE. We're a maturing industry now, and while there are still hundreds of vendors out there essentially trying to solve the same problem over and over, at least now the solutions are starting to look more like one another." I tend to agree with you. New digital signage software entrants are better served by bringing to market value added components to enhance industry leading platforms, like FireCast, that have at least 10 years head start. Time to market will be dramatically quicker and they would have a shot at making an impact. Bill, It was nice to meet you at DSE! I'd like to view your presentation for the content seminar. John: couldn't agree with you more! (obviously) But I do think we're starting to move in that direction -- see LocaModa and other "application" providers for evidence. I think it will be even faster and better once we announce some interoperability standards. Ediz: yeah, content really should have been front-and-center instead of in a little section in the back. Perhaps they'll revamp next year's floorplan to make a big content area right in the middle of everything (you listening, Chris Gibbs? ;) Jay: Likewise, nice meeting you. I'm in the process of turning the content day presentation into some blog articles, so they should be going up pretty soon. Teri: Thank you, thank you. I'll be here all week. Try the veal.